Despite the housing recovery since the Great Recession, the change in assessed value of our school districts in recent years should prompt great concern. 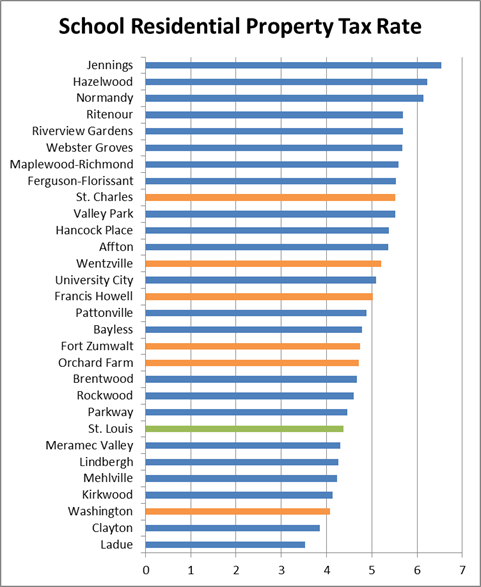 Only four of the thirty districts in St. Louis City, St. Louis County, and St, Charles County have increased from 2011 to 2015. Even those riding the development wave outward haven’t fared well. You would expect them to show a gain due to new construction making up for depreciation. Take into account the 5% of inflation over that time period and none are above water. The total assessed value of the thirty districts varies wildly. St. Louis Public Schools at $4,210,986,731 takes the top spot, and the Jennings School District rounds out the bottom at $95,577,080. The reliance on local taxes varies wildly too. Poorer districts receive more help from the state. A decline in assessed value is amplified for districts more reliant on property taxes. 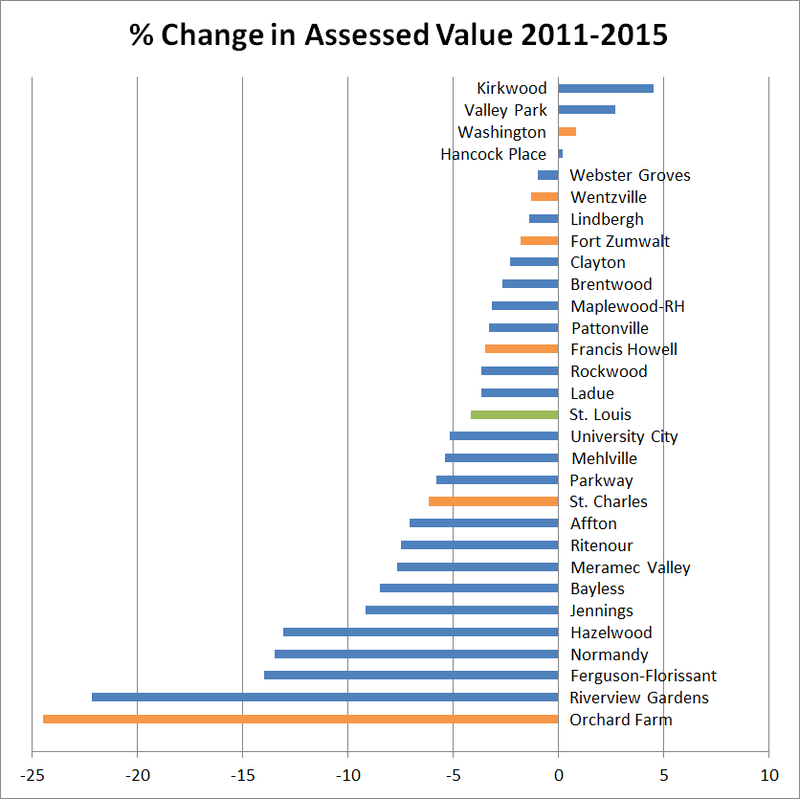 Affton had the 10th biggest drop in assessed value and is 10th most reliant on local funding. Not a recipe for long-term sustainability. 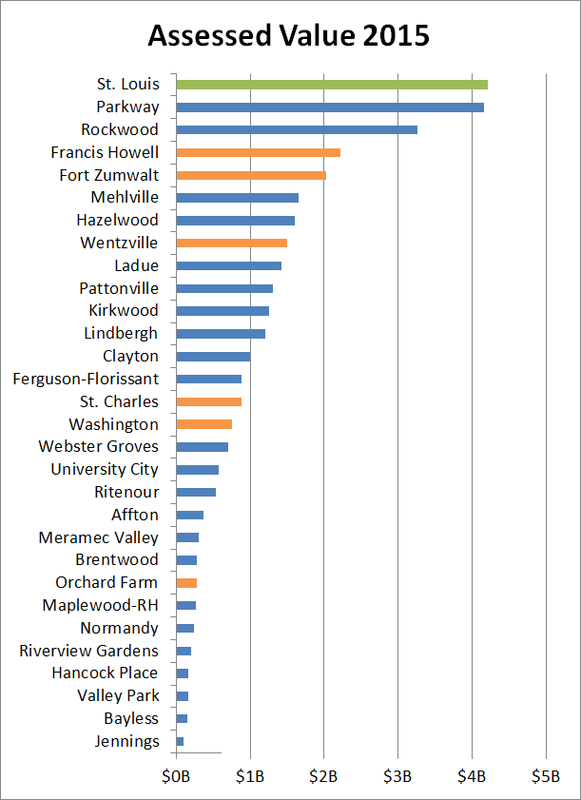 Parkway had 12th biggest drop and is 4th most reliant on local funding. Districts can’t look to the state to fill much of the gap as the Legislature has passed an income tax cut that goes into affect when growth in state revenues meets pretty easily-met targets. Over time we will likely see a further shift to local funding. It’s illegal for school districts to levy their own income taxes. Only St. Louis Public Schools has a sales tax of 2/3% and is the only one that can have one. School districts need to become more interested in increasing the productivity of the land within their borders and wary of subsidies that promote more low-yielding development of the type we’ve mostly been building since WWII. Lindbergh schools has been opposed to the proposed TIF for the Crestwood Mall redevelopment. SLPS has a rate increase on the April ballot, Prop 1, of $0.75 per $100 assessed. This would take it form the 8th lowest to 14th highest. 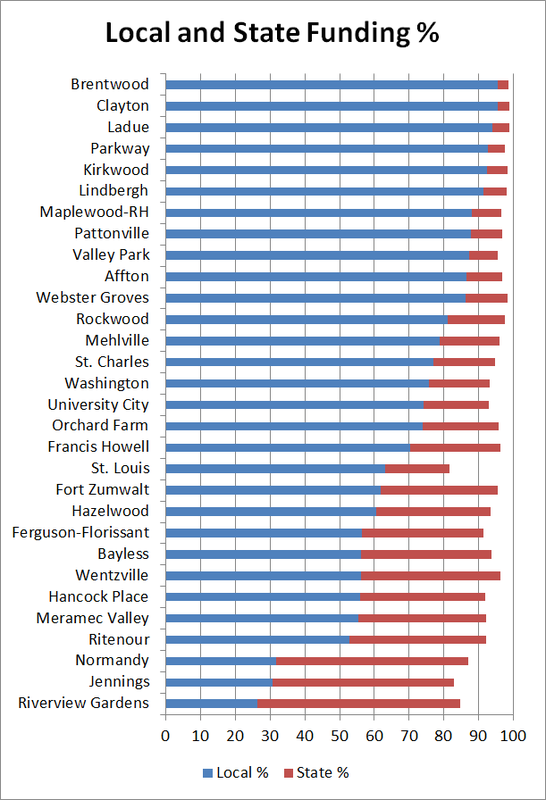 Note that St. Louis County also has the Special School District which has a rate of 1.2348 on top of the rates the individual school districts have. So take that into account when comparing rates. Mehlville voters passed an increase last November. Fort Zumwalt is trying again after Prop B failed last November, with Prop K, a 0.48 per $100 assessed increase. Maplewood Richmond Heights School District has an increase on the ballot of $0.55. It would go from 7th highest to 4th. MRH should be especially concerned with development within its borders because the city of Richmond Heights states in its budget that despite being dependent on sales taxes (page 4) lower reliance on property taxes and higher reliance on sales taxes, and utility and user fees is a goal (page 21). Richmond Heights is interested in development patterns that enhance sales tax revenues not necessarily more productive land uses that spur property taxes. Maplewood’s recent development decisions indicate it has the same goal. These cities and many in the st. Louis area seek sales in hopes that many of the sales tax payers don’t live in the city. If these trends continue, we can expect more school districts requesting property tax increases and cutting their budgets in the future.